Quinnipiac’s baseball team is doing everything it can to show it’s for real. Three upperclassmen are hitting at least .350 and one pitcher hasn’t allowed a run in two conference starts. The Bobcats haven’t captured an NEC crown since 2005, but they’re on the right track for a second title in 2011. It’s early, but the Bobcats are off to their best start since 2004. Quinnipiac (11-6, 7-1 NEC) heads into its first home series this weekend against Sacred Heart (8-12, 2-6) after taking on cross-town rival Yale in New Haven on Wednesday. With seven hits in a four-game sweep of Mount St. Mary’s and a team-leading .370 batting average in the NEC, junior catcher Kyle Nisson credited assistant coach Tim Binkoski and his teammates for protecting him in the lineup. “It’s easier to hit when you have guys behind you and in front of you that are also hitting,” Nisson said. The Wallingford native led the Bobcats in batting average at a .347 clip last season. Senior shortstop Mickey Amanti is hitting .364 while junior second baseman Chris Migani is hitting .357. The Bobcats are hitting, just as they did last year, but the difference this year is they are pitching, too. Lowering last year’s 7.00 team ERA to 2.71 this year shows the Bobcats can prevent runs. Gooley acknowledged the ERA improvement, but was more impressed with two less popular stats. Junior pitcher Anthony Cinelli has been a big contributor to the improved team ERA, as he scattered seven hits in seven shutout innings to earn a win over Mount St. Mary’s on Saturday. He didn’t allow any earned runs in his victory against conference foe Fairleigh Dickinson on March 20. Sophomore pitchers Derek Lamacchia and George Dummar join Cinelli with 2-0 records, and have combined to allow just three runs in 28 innings. 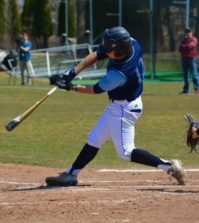 … Seniors Mike Bartlett and Joe Poletsky and junior Gabe Guerino are hitting at least .300. 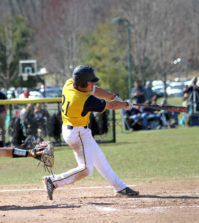 … Senior pitcher Andrew Rinaldi took the lone NEC loss against Fairleigh Dickinson on March 18. Rinaldi has saved three of the team’s seven wins.